Initiate - Firstly, a HTTP POST will be made to your Callback URL with the transaction. Your application MUST then synchronously return a JSON to accept or reject the transaction. Acknowledge - Finally, a HTTP POST will be made asynchronously to your Callback URL to confirm the transaction. NB: 0. Prepare - This is a custom pre-processing step for some types of integrations. The documentation is customized and provided separately based on the merchant's specifications. When a transaction is received, we will first send an Initiate via HTTP POST to your application's Callback URL. 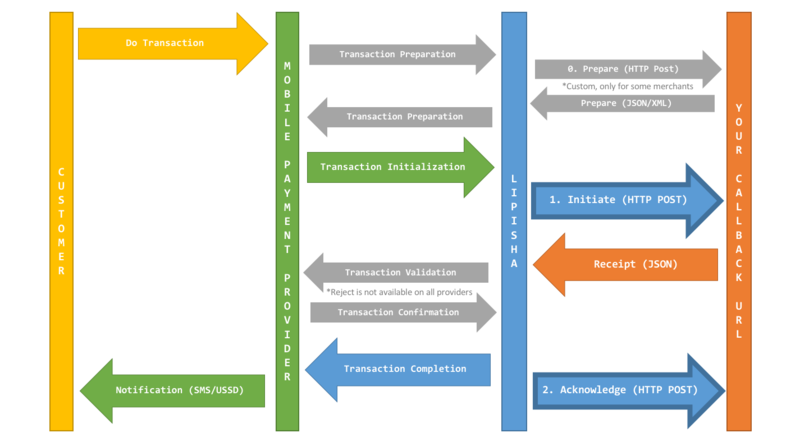 transaction_method Method used to carry out a transaction. Varies according to transaction_type and transaction_country. transaction_date Date and time of the transaction. On receiving the Initiate HTTP POST, your application should respond synchronously with a Receipt via JSON. transaction_status_description Description of the status. Transaction received successfully. transaction_status_action Action to carry out on the transaction based on status. Varies according to transaction_status. Default action is ACCEPT if not specified. Transactions which are valid are accepted and funds processed. Transactions which are invalid can either be accepted and funds processed or rejected before funds are processed. *REJECT status action is currently only available for dedicated paybill transactions. transaction_custom_sms Custom SMS to replace the default transaction SMS. *Feature is only available for merchants with branded SMS sender id. Dear JOHN JANE DOE, your payment of KES 100.00 via CU79AW109D was received. "transaction_custom_sms": "Dear JOHN JANE DOE, your payment of KES 100.00 via CU79AW109D was received." On receiving your Receipt JSON, we will respond asynchronously with an Acknowledge via HTTP POST. transaction_status_description Description of the response. Transaction processed successfully.